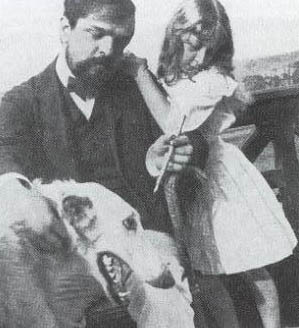 Bargemusic begins the weekend with a concert on Friday evening, November 9 at 7:00, marking the 100th anniversary of the death of Claude Debussy (shown in the photo, taken in 1904, with his soon to be stepdaughter, Hélène “Dolly” Bardac, and a very impressive Borzoi; see here). The concert will feature works by Debussy, along with others by his contemporary Ravel and by Stravinsky, on whom he was an influence, performed by Rolf Schulte on violin and Aaron Likness on piano. On Saturday evening, November 10 at 6:00, and again that evening at 8:00 (same program), violinist and Bargemusic Artistic Director Mark Peskanov, along with members of the Semplice Players, will play works by Mozart, Bartok, Haydn, and Beethoven. On Sunday afternoon, November 11 at 4:00, pianist Jeffrey Swann will perform a concert, “The American Dream,” including American themed works by Debussy, Busoni, and Stravinsky, as well as by the American composers Gershwin and Barber.